Vertigo Wall-Mounted Fireplace | OhGizmo! Adding a fireplace to a house or condo that wasn’t already built with one is a pretty hefty renovation. So why go to all that hassle when you can simply hang this Vertigo fireplace on any wall you like, or as many walls as you like for that matter. Ok, so maybe installation isn’t as easy as hanging a picture since you do require a natural gas hookup, but I bet this will draw a lot more attention than a photo of the family dog. And besides providing obvious mood lighting and extra heat the Vertigo also has a patented catalytic system that will burn off the odorous and stale air in whatever room it’s mounted in. why not just get a “fireplace” screensaver for your plasma? Now that is a unique idea, but I’m not sure how popular it will become. Pretty steep price with it. Just had a vertigo fire fitted! 100% efficient it says! Well, did you know you need an air brick? It has to be a certain size and yes, you get a lovely draft through! 100% efficient? Not only do we have this draft but also after 10 – 20 minutes the fire switches itself off! 100% efficient? I don’t think so! We’ve paid alot of money – for what? A fire that says it’s 100% efficient, but you get a draft from the air brick and it swtches itself off after 10 – 20 minutes!!! And yes, it’s just done that!!!!!!!!!!!!!!!!! the vertigo fireplace you just had installed, was it installed by a professional ( a real professional or on a discount price and you received a discount job)? 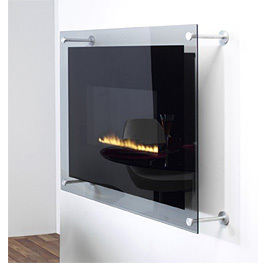 I am fooling around with different fireplaces, either electric wall mounted or dual fire wall mounted? Let me know please. Thank you so much… Also, what state are in … I’m in S. California? So I don’t need heat like I’m in a blizzard.